Posted by Jill S. Schneiderman in "Eaarth", Anthropocene, Bill McKibben, book review, Buddhist concepts, climate change, earth community, earth cycles, geologic time, Thich Nhat Hanh. This piece is cross-posted at Shambhala SunSpace, CommonDreams.org, and Truthout. In his recent book, The World We Have: A Buddhist Approach to Peace and Ecology (2008), the great Buddhist teacher Thich Nhat Hanh asserts that Buddhism, as a robust type of humanism, allows people to learn how to live on our planet not only responsibly, but with compassion and lovingkindness. Every Buddhist practitioner, he says, should have the capacity to “protect” the environment and determine the destiny of the Earth. Bill McKibben, author of more than a dozen books including The End of Nature (1989), perhaps the first book for the layperson about climate change, and founder of 350.org, a global warming awareness campaign that coordinated what CNN called “the most widespread day of political action in the planet’s history,” has devoted much energy to this project of awakening. McKibben may not be a Buddhist, but his interview with Krista Tippett, host of American Public Radio’s Speaking of Faith, reveals him to be a spiritual thinker. His most recent effort to bring about this tectonic shift in the collective human mind and heart is his book Eaarth: Making a Life on a Tough New Planet. McKibben argues that humans have changed Earth in such fundamental ways that it is no longer the planet on which human civilization developed over the past 10,000 years. Seawater is becoming acidic as oceans absorb carbon from the atmosphere; the cryosphere—Earth’s once frozen realms of ice caps and high mountain glaciers—has melted or is in the process of doing so; tropical regions of the globe have pushed two degrees further north and south changing patterns of rainfall and causing droughts, fires and floods. What’s more, these geographically vast features are changing rapidly. As I tell my students, we humans have acted as geologic agents at non-geologic time scales. McKibben’s central point is a corollary to this formulation: global change is no longer a threat, a changed globe is our reality. Hence, McKibben’s homophone: we live on Eaarth, not Earth. His book is the call to stir that Thich Nhat Hanh prescribes. In the service of helping to rally the populace to such awareness, I’d like to add some Buddhist geoscience to McKibben’s already excellent reality check. The Buddha spoke of the impermanence of things and in The World We Have, Thich Nhat Hanh reminds us that the sixth-century Greek philosopher, Heraclitus said that because a river changes constantly, we never step into the same river twice. Hanh writes, “Nothing stays the same for two consecutive moments. A view that is not based on impermanence is a wrong view. When we have the insight of impermanence, we suffer less and we create more happiness.” According to Thich Nhat Hanh, people resist two types of impermanence: instantaneous and cyclic. Using the analogy of water set to boil, he teaches that the increase in water temperature from moment to moment manifests instantaneous impermanence. However, when the water boils and turns to steam, we witness cyclic impermanence—the end of a cycle of arising, duration and cessation. Thich Nhat Hahn suggests that we must look deeply at cyclic change in order to accept it as an integral aspect of life and as a result, not startle or suffer so greatly when we endure shifts in circumstances. Looking deeply at cyclic change—for example the transformation of rocks to soil and back again—is what we geoscientists do. We gaze deeply at impermanence and know that without it, life would not be possible. McKibben avers that we have passed the geological moment when we might possibly have avoided the mutation from Earth to Eaarth. Though he doesn’t name it as such, we have moved from The Holocene Epoch—the most recent 12,000 years since the Earth emerged from the last major ice age—into what Paul Crutzen, the Nobel Prize-winning chemist called the Anthropocene—a new geological epoch denoted by novel biotic, geochemical, and sedimentary effects of global proportion induced by human activity. To a Buddhist geoscientist such as I, this formulation of our current planetary predicament makes deep sense. In order to understand why, I must mention a few monumental concepts in Earth history, namely evolution, punctuated equilibrium, and extinction. Impossible a task as it is to explain such big topics, since we humans seem to excel at taking in more than we can digest, I’ll give it a try. Evolution—commonly misrepresented as improvement or progress—is, quite simply, change. Most familiarly, species evolve; they do so by punctuated equilibrium, a fancy phrase that means that organisms mostly stay the same but when they do change, they do so quickly and in spurts of geological time. Or they die. Which brings us to extinction events. The geological record is replete with them, their intensity ranges from the small and local to the massive and global—the ones that shattered Earth’s biological order. Like the episode 65 million years ago that famously wiped out dinosaurs as well as numerous other species across the spectrum of life in all habitats sampled from the fossil record. Seventeen percent of families (the taxonomic unit above genus and species, a family can consist of a few to thousands of species) were lost in that extinction event. Or the greatest mass extinction as yet, the one 245 million years ago that marks the end of the Paleozoic Era; it rid the Earth of trilobites, those early marine invertebrates with a segmented body and exoskeleton that belong to the same group (Phylum Arthropoda) as modern-day crabs, insects and spiders as well as fifty-four percent of all living families. These and other mass extinction events happened concurrently with vast climatic and physical disturbances on Earth that were outside the norm of what species and ecosystems ordinarily survived. Such extreme physical changes doubtless had something to do with the occurrence of the extinctions in the first place. Lest I embark on a far-reaching lesson in Earth history, I’ll make the point simply, that over geological time life on the planet and Earth itself have morphed from one form to another. Our seas were acidic in the Archean and our atmosphere was oxygen-poor in the early Proterozoic (“age of first life”). This is the way I see our situation: all beings now live on Eaarth during the Anthropocene. Like other organisms before us we are challenged by changed environmental circumstances and must adjust to Eaarth in its current state. To this Buddhist geoscientist the planet and its life forms epitomize impermanence. When I read the history of our planet I can’t help but see it as fitting with the concept of cyclic impermanence in particular. I ask, how will the species homo sapiens fare as we make our way across the epochs from Holocene to Anthropocene? Will humans and other great apes be counted among the taxonomic families that succumb in this latest great extinction? Will the record of our one-time presence on the planet comprise only an early Anthropocene stratum of bones, tools and garbage? Both McKibben and Thich Nhat Hanh give us reason to believe that human beings, if we wake up in the Anthropocene on Eaarth, instead may persist as one of the long-lived multicellular species on the planet (think horseshoe crab). In the second part of Eaarth, McKibben argues that the catalyst for the evolution of Earth to Eaarth has been insatiable, fast growth. He says that any hope for our future on Eaarth depends on “scaling back” and “hunkering down”—creating communities that concentrate on the essentials of maintenance rather than the spoils of growth. He provides inspirational examples of neighborhood windmills, provincial currencies, corner markets, and local internet communities. Thich Nhat Hanh does the same, describing the efforts of his Sangha to practice mindful consumption. Both visionaries advocate proximal, small-scale ways of living. 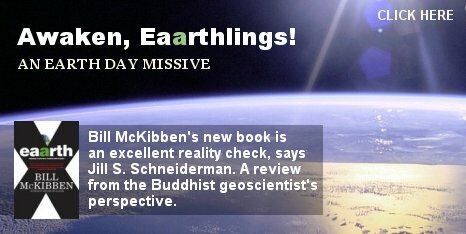 By looking back in Earth history as we geologists do, I’d like to support with geological evidence the soundness of McKibben’s and Thich Nhat Hanh’s approach to surviving on Eaarth. The Earth’s most successful and abundant life forms are prokaryotes (organisms that lack a cell nucleus or any other membrane-bound organelles). They appear as fossils in 3.5 billion year old rocks and persist today in nearly all environments where liquid water exists. Some thrive in harsh regions like the snow surface of Antarctica while others persist at marine hydrothermal vents and land-based hot springs. Some use photosynthesis and organic compounds for energy while others obtain energy from inorganic compounds such as hydrogen sulfide. Prokaryotes keep things pretty simple and make do with what exists in their immediate surroundings. Lots of them live together. They’ve survived numerous extinction events. Can it be that the collective simplicity they represent suggests a way forward for awakened Eaarthlings? This entry was created by Jill S. Schneiderman, posted on April 13, 2010 at 10:25 am and tagged Buddhist concepts, Environment, Science. Bookmark the permalink. Follow any comments here with the RSS feed for this post.